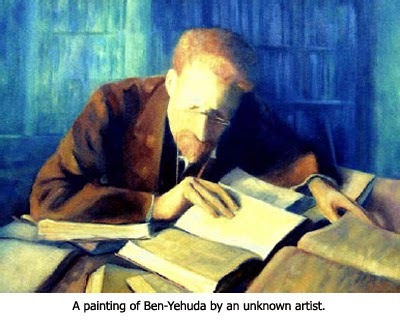 What was the key event that flared Ben-Yehuda's passion to revive Hebrew? In 1877 Russia went to war against the Ottoman Empire in behalf of the liberation of the Balkans. And the concept of nationalism — "one state for each nation" — became the battle cry that swept Europe and which ultimately led to the outbreak of World War I. After a number of hours of reading the papers and reflecting on the fate of the Bulgarians and their future freedom, suddenly, as if lightning struck, an incandescent light radiated before my eyes... and I heard a strange inner voice calling to me: "The revival of Israel and its language in the land of the forefathers!"... The lot was cast. My life and strength were given from that time onto the labor of reviving Israel and its tongue in the land of the fathers. Eliezer closed this letter with a statement that would become his lifelong motto: "The day is short; the work to be done is so great!" In 1879, when Ben-Yehuda was only 21, a prestigious Vienna newspaper published an article of his titled, "A Burning Question." The editor changed the name to "A Weighty Question." It was to be one of the first ever Zionist manifestos, calling on the Jewish people to return to their homeland. In the fourth segment on the amazing prophetic fulfillment of the return of the Hebrew language, we'll look at a key discovery that directed Ben-Yehuda's pronunciation of Hebrew. Just watched the L&L DVD on this subject. Excellent program. It was nice that most of it was done with Dr. Reagan on a street in Israel. Then finished off on the set with Nathan. I love L&L DVDs! Learned a lot!! !